It’s the first WorldTour race of the 2016 season and it’s sunny and warm and filled with joeys, koalas and crocs. 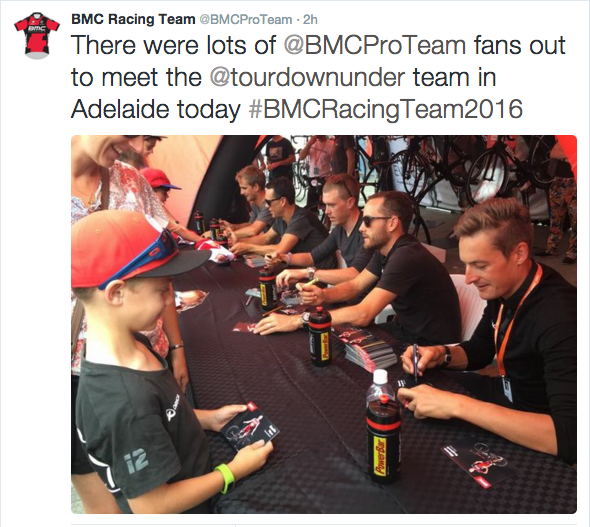 Here is part one of our slightly irreverent look at the Tour Down Under! This is the home of the riders for the entire tour and one of the (many) reasons they like it. No long transfers! 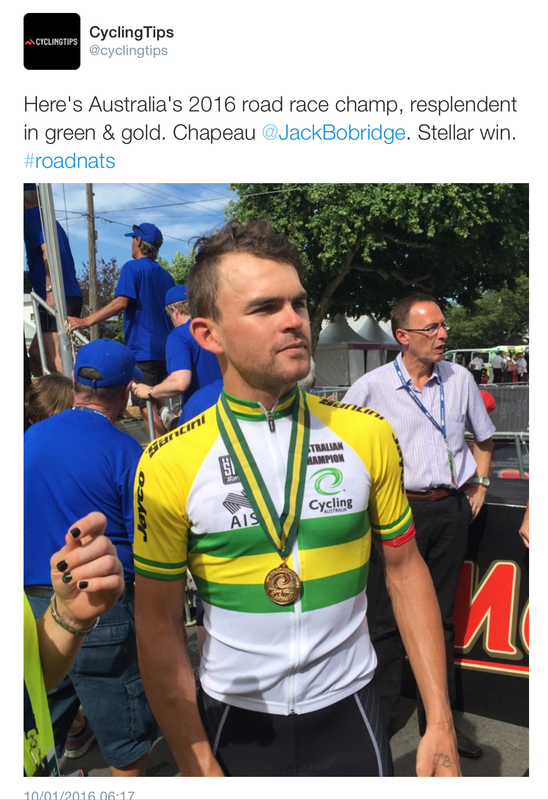 The new Australian road race champion, Jack Bobridge is going to want to show off the green and gold jersey this week. Last year, he took the mountains jersey and won stage 1 – he’ll be looking to improve on that result this week. 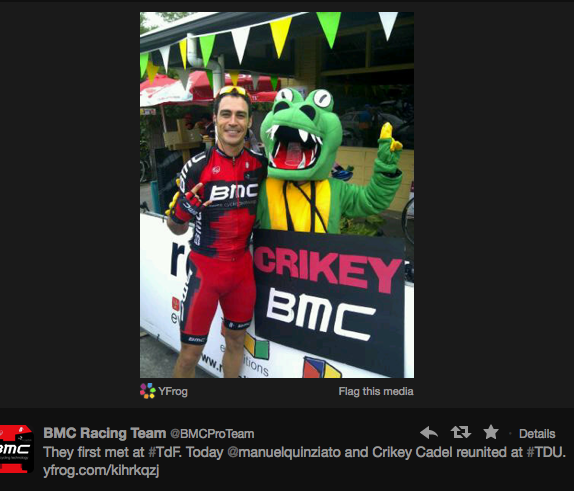 C is for Crikey Cadel! Yes, it’s our favourite giant crocodile who is always out and about at the races. 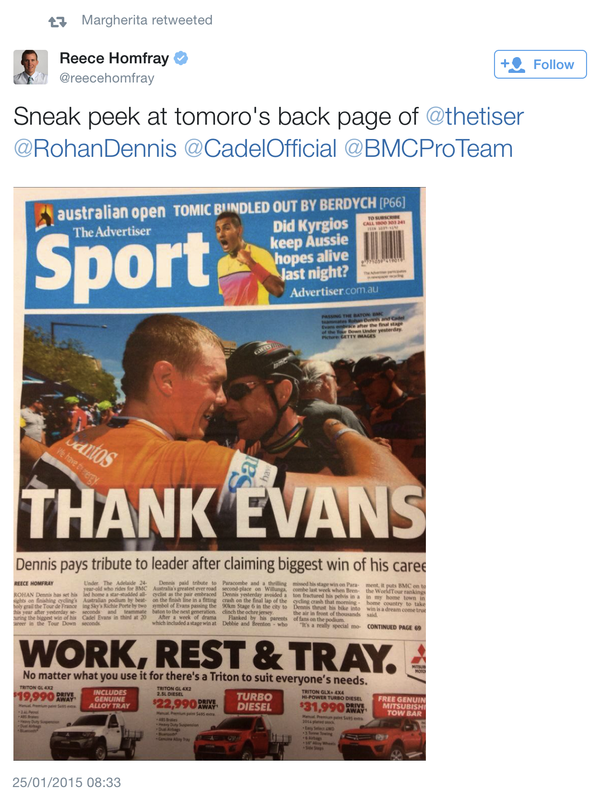 Not only does he have a long history with the TDU, he also has a long history of appearing in Tweets of the Week. Here he is with Manuel Quinziato in 2012, which made one of our first TotW columns! We just had a tweet through saying he has landed in Australia for another TDU! The newly crowned 2016 Australian TT national champion, Rohan Dennis, is also the returning TDU champion. His victory last year was aided by BMC teammate Cadel Evans in his last professional race before retirement. The other day, Dennis said he was looking to ‘make history’ this week. As I also follow NASA and the Int’l Space Station on Twitter, I’d momentarily thought he was aiming for a space walk, but no, he was talking about being the first returning champion to take back-to-back wins. Although the Tour Down Under was established in 1999, it wasn’t until 2008 that the men’s race became part of the WorldTour. It’s been going from strength to strength ever since. The relaxed nature of the race, the country and the fact that the riders stay in one place the whole week means this is a fan’s paradise. 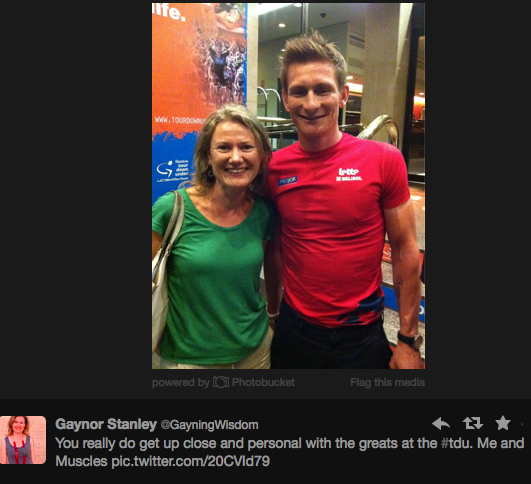 Andre Greipel (always a gent with the fans) pictured here with a thrilled Gaynor from a few years ago and the BMC team just hours ago at their team meet-and-greet. Simon Gerrans has won the most Tour Down Under titles with three: 2006, 2012 and 2014. He won in the green and gold national champion’s jersey in 2012 and 2014. Chloe Hosking is just one of the riders participating in this year’s women’s TDU – which has just been promoted by the UCI to WorldTour status. Here’s what she had to say about the race. Is it just me that thinks Darryl Impey winning the sprint jersey last year is kind of strange? Or have I forgotten that he’s a sprinter or something? Anyway, he did. And I was struggling for an I. 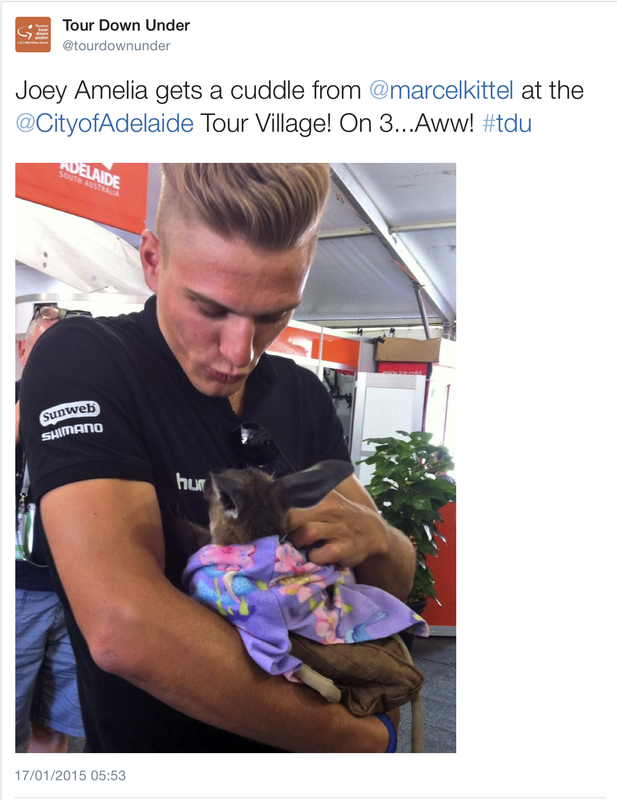 No, not Tribbiani, but the baby kangaroos that crop up in practically every rider picture from Down Under. They also get to hold big snakes (not a euphemism) and koalas. Below, the ArgoSunGod last year cuddling a joey. While the TDU has a King of the Mountains jersey, it doesn’t actually have any mountains. So we’re really talking King of the Hills! Kirby Hill is one of the more testing – at nearly 4km long at a 6% average gradient, it does take its toll. We’ll see that this year on Friday for stage 4. The Tour Down Under was always one of Jens Voigt‘s favourite races, so it’s little surprise that he would routinely be named Most Aggressive Rider after some gruelling stages. Gruelling because he sadistically made them so.